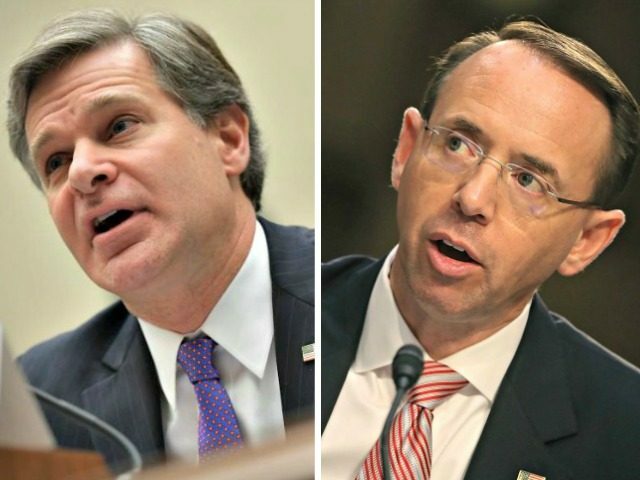 Representatives of the Justice Department (DOJ) and FBI proposed a second meeting with the leaders of both parties in Congress Wednesday, offering to flesh out the information on one or more “informants” in the 2016 Trump campaign they provided at a briefing last month. According to a senior DOJ official’s statement to Politico, this latter group, consisting of Speaker of the House Paul Ryan (R-WI), House Minority Leader Nancy Pelosi (D-CA), Senate Majority Leader Mitch McConnell (R-KY), Senate Minority Leader Chuck Schumer (D-NY), and the chairs and ranking members of the House and Senate Intelligence Committees, will reconvene on Monday or Tuesday to receive additional documents. Presumably these are also related to Oxford professor Stefan Halper and possibly other “informants” in the Trump campaign and their relationship to the FBI. It is not clear from the statement who will represent the DOJ and FBI at this new briefing. DOJ and FBI officials will, according to the statement, provides answers to questions the Gang of Eight raised at the first briefing. The statement specifically notes certain questions raised by Speaker Ryan, but does not disclose what these questions were. The offer of the second briefing to answer Ryan’s questions appears to answer a call from Rep. Ron DeSantis for the House leadership to be more zealous in its pursuit of the information about Halper. “Informants are used all day, every day by law enforcement,” he said. Gowdy and Nunes are not somebody’s lawyer. I don’t know the last time they practiced criminal law. I like both of them. They are not the lawyers. They don’t have the awesome responsibility of representing somebody who is being treated in a way you wouldn’t treat a common criminal. So don’t tell me about Gowdy and Nunes. I’ve got more experience than the two of them by ten.